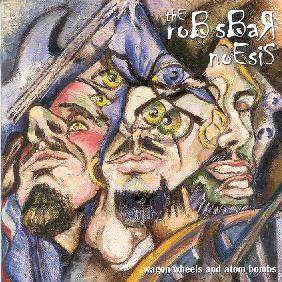 The Rob Sbar Noesis - "Wagon Wheels And Atom Bombs"
This is the debut CD by guitarist Rob Sbar. The music is jazz-rock fusion instrumental guitar music. Rob also has a big band ensemble which is featured on one complete track (Blue Harvest) and two excerpts. The playing is excellent by all players and the man can shred on the guitar with the best but it is the other parts of the music that I like the best. You can hear the big band influence on the style of playing on the track I woke up this morning with this human skin on… and I can’t seem to get it off. 16 Shades of Gray opens with an eastern riff but then takes off and leaves this behind for a sort of funky groove and some more shredding. Media induced Paranoia somehow is Joe Satriani like. Blue Harvest is a laid back song in the way the bass, drums and other instruments play but the guitar is a bit over the top at times. Diet Soda, Chinese Food and a single Yellow Daisy is a 10 minute piece and more experimental than the rest of the CD, with multiple time changes and feeling expressed. The CD closes with the title track, an excerpt from the Big band. The CD has really cool artwork, great imaginative song titles and amazing liner notes. For more information you can visit the Rob Sbar web site at: http://www.rob-sbar.com. Contact via snail mail c/o Aggregate Recordings; PO Box 286351; New York, NY 10128-0013.